Hi, Good Morning. Thank you, friends and viewers. 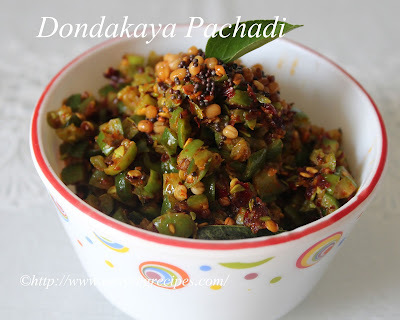 Today I will post how to make dondakaya pachadi or chutney with Ivy Gourd or tindora recipe. Many of my friends ask me that how do you cook without onion and garlic, they say that it is very difficult to cook anything without them. We are asked not to eat them during the month of Karthikam. A lot of people around me wants to give a try, but in vain. So, I am here to post some recipes without onion or garlic. It is very simple. I have learned this from my mom. We can use little bit ripen tindora also. We cannot store this vegetable for more than three days, afterward, they tend to ripe. So to make the best use of the ripen vegetable instead of throwing them make this simple chutney. My mom does not blend the tindora pieces in the jar, so I also do not blend them. But if you want you can do that. We get small crunchy pieces while having it with hot rice. First time when I made this chutney, by mistake I blend everything into a smooth paste. I need to market it and have to tell everyone that this is tindora chutney. But later I realised that if we leave some pieces of tindora without blending them, chutney will be tastier. We need not market it also. The toughest job or boring job in making this chutney is chopping tindoras, rest we can finish in a jiffy. To do this I take the help of my domestic helper. I will give them to her and ask to chop. She loves that work as she can do it leisurely and have some gossip with me. If only I entertain it. Dondakaya pachadi -- A nice accompaniment to rice. Chop dondakaya/ivy gourd into small pieces. Heat oil in a kadai, add mustard seeds, black gram, fenugreek seeds and asafoetida. Allow them to splutter and add red chillies and green chillies. Saute them for a while. or till the chillies turn into light dark shade.Switch off the flame and keep them aside. In the same kadai, add oil again and fry dondakaya/ivy gourd pieces. Fry them till they become soft and smooth. Add salt to cook them fast. To know whether the vegeable cooked completely or not, press them with fingers. If they become mushy as soon as we press them, they are done. In a blender jar, add red and green chillies, half portion of tadka(mustard sees, black gram and fenugreek seeds), add tamarind and salt. Add garlic also, if adding them to the chutney. Becareful while adding salt as we have already added to the ivy gourd pieces. So add little of it. Do not add ivy gourd pieces. Blend chillies to coarse powder. Add this spicy mixture to the above ivy gourd pieces and also remaining portion of tadka. Mix them well and serve. Serve dondakaya pachadi with hot piping rice.